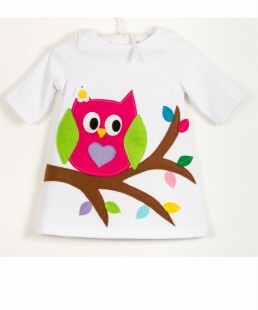 Colorful, playful and highly original handmade clothes for our little but also older girls! 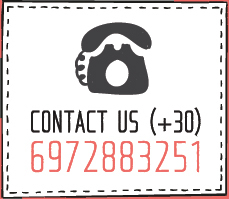 Made of excellent quality materials, lots of love and fantasy! Choose your favorite today and stand out! 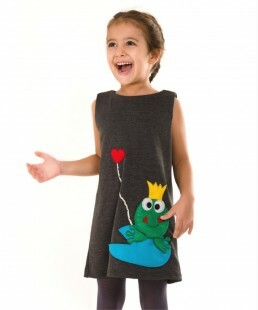 A great love "comes alive" and becomes a cuddly dress that you will love to wear for a long time! Sewn in soft viscose with elasticity, no buttons or zipper, soft and comfortable! The little prince and his beloved fox are made of soft felt. Wear it at parties, birthdays or ay special occasions and impress! 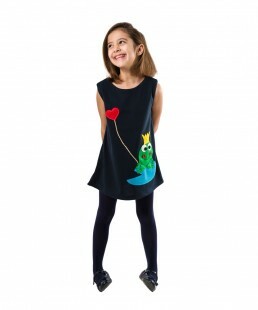 A unique handmade dress for the unique little girl you love! Which sweet little princess will give a kiss to the cutest frog?! An enchanted prince transformed into a frog waiting his kiss from your sweet girl! Beautiful colors, soft fabric without any buttons or zipper! 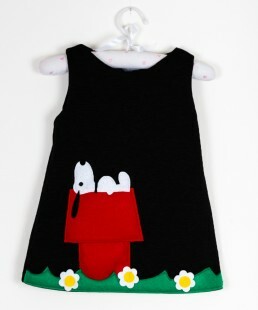 A beautiful handmade dress with a felt applique design that will delight your little bug! Our beloved Scooter returns leaner but even more beautiful! 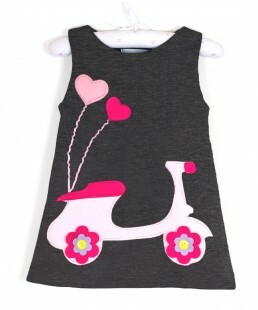 Fuchsia and pink colours dominate stronger over the black background and your little girl looks adorable! Combine it with leggings or tights and a T-shirt from the inside in the winter and of course without in spring! For the woman’s dress "scooter" click here. The unforgettable and beloved Snoopy came this year to beautify our companionship and keep us company at every walk! 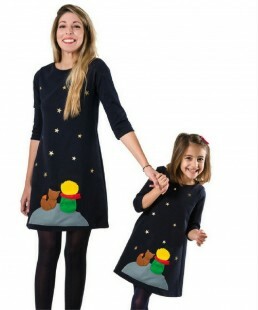 A unique dress that will take off daily appearances of your girl! Soft fabric with elasticity, without buttons and zippers, you will enjoy in with tights or leggings in winter or without in spring! Wear it to a party, a visit and every time of the day! The beloved and popular owl came to our beautiful collection and made her even prettier! ! Sewn in soft viscose fabric, comfortable and flexible, will become your best companion! Colorful felt leaves provide color and makes us smile! Wear it in winter and in spring time and be unique! 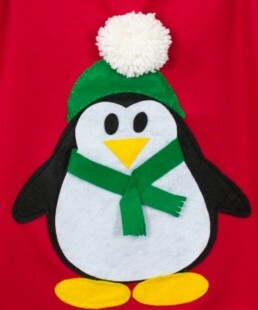 That sweet little penguin has stolen our heart!! 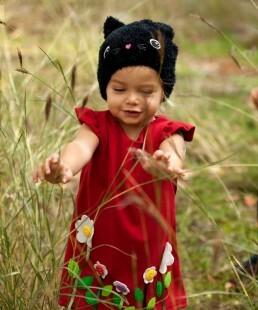 Our favorite penguin put felt scarf and cap, came in red and is ready for winter walks with your little one! Give it to a sweet little girl you love and get ready for unique and special apperances! 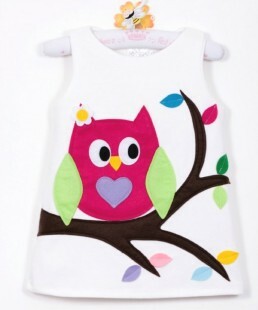 A beautiful handmade applique dress for romantic girls! In cypress color of soft viscose and cotton fabric and a lovely applique heart with little felt daisies give color and liveliness to your winter look! Combine it with gray tights and create a unique winter and spring appearances! 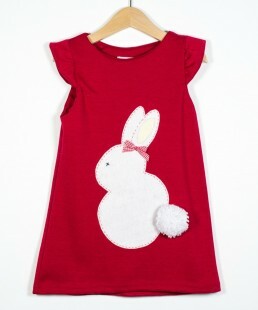 A beautiful applique dress with felt bunny pom pom tale! So sweet just like thw little girl who will wear it! The dress is in red tones of soft cotton and viscose fabric and can me worn throughout the year either with a jumper underneath or plain in spring! Wear it also as a top when your girl gets taller! 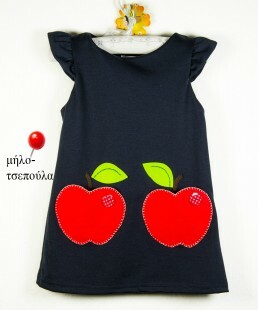 This is one of a kind handmade dress in dark blue and beautiful felt apple pockets for her little hands! Two bright red polka dots buttons give the extra touch of this beautiful dress! 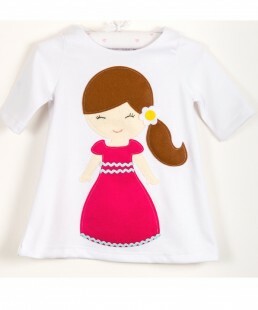 Made of soft cotton fabric and ideal for everyday wearing! It will become her favourite for quite a long time! She can wear a romper in any colour she likes underneath in winter and without one in spring time! Wear it also as a top when you little girl gets taller! 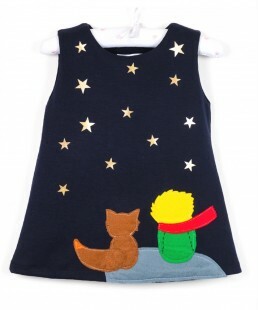 A unique autumn-winter girl's dress made of soft cotton fabric in dark blue and colourful raindrops! 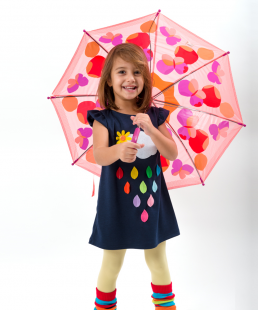 A happy felt sun and orange polka dot button make this dress really cute! Beautiful and handmade dress it will become her favourite for quite a long time! She can wear a romper in any colour she likes underneath in winter and without one in spring time! 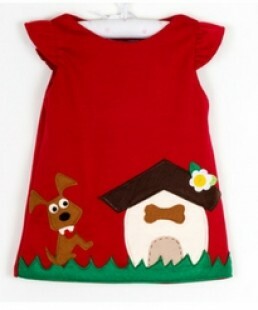 You can wear it also as a top when you little girl gets taller! A beautiful red blooming garden for your little girl! 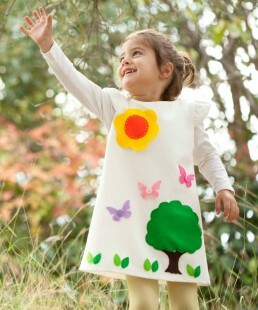 Felt little flowers and bright polka dots buttons make a unique handmade dress suitable for her birthday,every day walks or any special occasion! She can wear a romper in any colour she likes underneath in winter and without one in spring time! 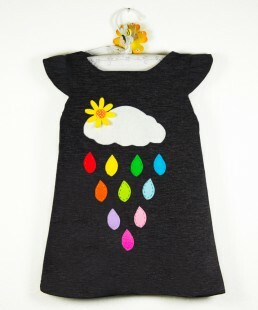 You can wear it also as a top when you little girl gets taller! Another sweet dress for the sweetest girls! 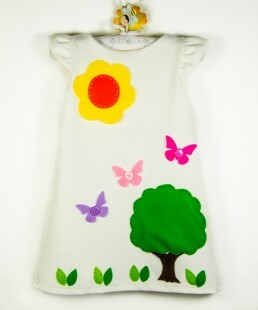 A bright yellow felt sun, lovely green tree and three little felt batterflies in girly colours make this dress one of a kind! Tottaly handmade and carefully made of soft cotton adn viscsose fabric with little elastane. Ideal for parties and birthdays as well as everyday wear! You can wear a top underneath in winter time and without one in spring time! These beautiful pink and fuchsia felt love birds make this dress simle and elegant! In dark blue color made by soft winter fabric makes it suitable for everyday wearing! 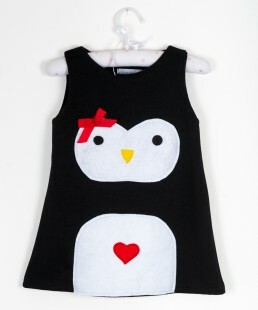 She can wear it with a pair of leggings and a top underneath in fall/winter time or without during spring! 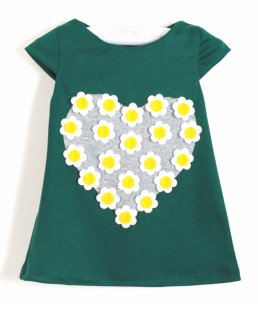 Wear it also as a top when your little one gets taller!